Camping is a unique, fascinating way to spend your vacations. Of course, you already know that! Camping Alpe di Siusi/Seiser Alm is located in the middle of beautiful, picturesque scenery in the Sciliar/Schlern Nature Park. 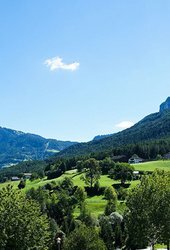 You will be able to enjoy the imposing scenery created by the Sciliar/Schlern mountain range. Every night you will be able to admire the magnificent nature spectacle when the Dolomites peaks seem to turn red in the evening sun. Our guests particularly appreciate the proximity to the Laghetto di Fiè/Völser Weiher bathing lake, the golf course and the Alpe di Siusi/Seiser Alm hiking resort. All attractions are close by and easy to reach even without a car: You will enjoy the freedom of movement. Camping Alpe di Siusi/Seiser Alm offers the perfect conditions for romantic camping vacations. All the conditions for your romantic camping vacations at Camping Alpe di Siusi/Seiser Alm are there! You can look forward to a stay full of comfort, surrounded by marvelous scenery.